FORT WORTH, Texas — Kyle Busch blew past Todd Bodine on a restart on Lap 127 and held off Johnny Sauter over the final 20 laps to win Friday night’s WinStar World Casino 350 NASCAR Camping World Truck Series race at Texas Motor Speedway. Bodine chose the outside lane for the final restart, but Busch cleared Bodine’s No. 30 Toyota through Turns 1 and 2 and held the lead the rest of the way. Sauter came home second, followed by Matt Crafton and Bodine, the series points leader. Bodine increased his margin to 230 points over seventh-place finisher Aric Almirola with two races left in the season. Bodine can clinch his second series championship by finishing fourth or better next week at Phoenix. Busch’s seventh win in 14 starts this season gives him 23 career victories in the series. In retrospect, Bodine felt he made a mistake in choosing the outside lane for the decisive restart. Busch disagreed. Instead, everything fell Busch’s way. “I don’t know whether I got a better push from behind, I had a better lane that we drafted, or what happened there, but he didn’t stay next to me as well as I expected him to,” Busch said. “I got clear of him, and I was like, ‘Man, this right here was fortune.’ I wasn’t expecting to be clear so quick. I figured I’d have to race him. Bodine had assumed the lead on Lap 111, when Bobby Hamilton Jr., who was off-sequence on pits stops, brought his No. 47 truck to pit road from the top spot. At that point Bodine held a lead of 2.198 seconds over Busch. That advantage reached 3.243 seconds when Lance Fenton spun in Turn 2 to cause the fourth caution of the race on Lap 120. But that lead disappeared with the yellow flag and gave Busch the opportunity he needed on the Lap 127 restart. Defending series champion Ron Hornaday Jr. continued his star-crossed season. On Lap 52, Hornaday slowed to avoid Miguel Paludo’s truck, which had slammed into the wall. Tayler Malsam’s Toyota bounced off the outside wall and turned Hornaday, who retaliated by spinning Malsam. Hornaday finished 32nd. Note: With the victory, Toyota clinched its fifth straight manufacturers’ championship in the series. … Busch, who owns his No. 18 truck, extended his lead to 72 points over the second-place No. 30 truck, fielded by Germain Racing, in the owners standings. 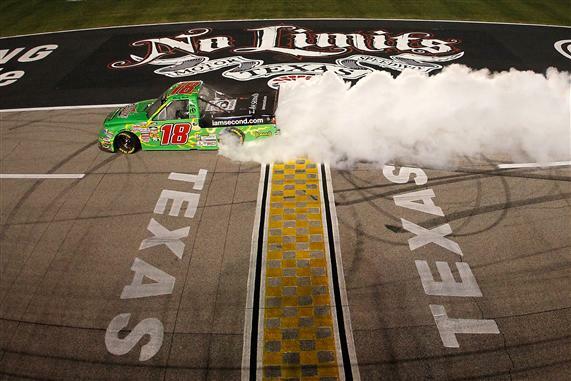 … Busch has a record seven wins at Texas across all three of NASCAR’s top series. On Saturday, he starts fourth in the O’Reilly Auto Parts Challenge, attempting to win his sixth straight Nationwide Series race at the 1.5-mile track. … Parker Kligerman, 20, finished ninth in his truck series debut.